This weekend I was lucky enough to enjoy a friend’s wedding at Middleton Lodge in North Yorkshire. The celebrations had actually begun a week earlier, with a hen party involving tea at the famous Betty’s in Harrogate.As a student in York I enjoyed many celebratory meals at their Betty’s Cafe and knew they would not disappoint. The Harrogate branch has been going strong since 1919 and it’s not hard to see why. Under the attractive wrought-iron canopy the windows are always full of the finest crafted cakes and chocolates, not to mention their trademark Fat Rascals. As we had booked a table in the Imperial Room we could bypass the queue outside, and head straight up to the airy room with views over Montpellier gardens and a live pianist. After taking our seats we were greeted with a glass of pink champagne to sip whilst we browsed their extensive list of speciality teas and coffees. I was tempted by the delicate China rose petal tea, but in the end went with a good old Earl Gray. Served in a proper silver tea service it is charmingly old fashioned, as was the three tier stand piled with various delights. On the first tier were little finger sandwiches of the tastiest thick Yorkshire ham, smoked salmon and egg mayonnaise, crusts cut off of course. On the second tier came two miniture fruit scones, with thick clotted cream and homemade jam. Finally was a top tier with three of the prettiest little cakes, unique to the Imperial Room. All the guests enjoyed their tea and most stopped in the shop on the way out to pick up more treats to take home. So back to this weekend and our stay at Middleton Lodge, a privately owned Georgian mansion in the North Yorkshire countryside. After arriving on the Friday evening we were treated to barbeque style food of venison sausages, lamb and mint burgers, and fresh salads of asparagus and soft boiled eggs or goji berries and macadamias. Then it was into the large library, featuring a full size snooker table, where the men enjoyed smoky whiskys or Middleton Lodge’s own real ale, and the women were spoilt with an array of gins to take with their tonic. Breakfast the next day was either a continental affair or you could order a traditional cooked breakfast. With eggs whichever way you liked, large field mushrooms, locally sourced sausages and the crispest bacon this was what I opted for the morning after. The house is run to give a home from home feel and you can help yourself to teas and coffees from the large guest kitchen at any time of day. You are encouraged to enjoy these in any of their beautiful sitting rooms, complete with roaring fires and the day’s newspapers. After the wedding ceremony canapés such as mini roast beef and Yorkshire pudding were served alongside baby bloody Mary’s and other tasty treats. We then headed over to the marquee for the wedding breakfast. To start we had confit salmon with celeriac remoulade and beetroot puree. 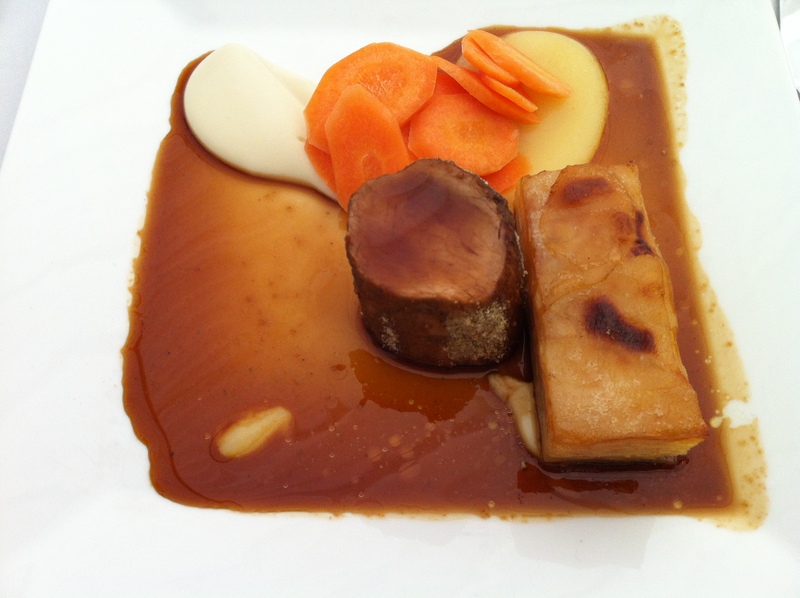 The main course was fillet of pork which was rolled in sage and garlic crumb, with apple puree and sage jus. This was served with juicy buttered mange tout, green beans and carrots. 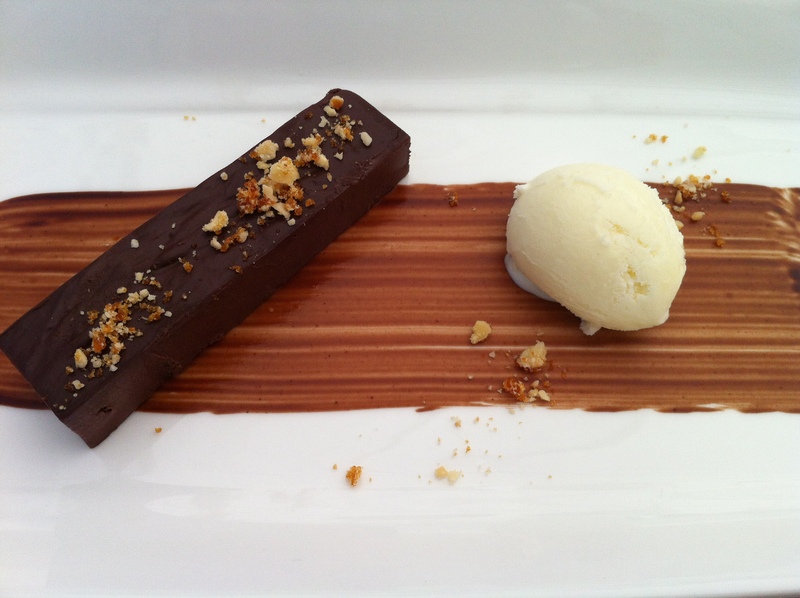 The desert was a rich dark chocolate delice with salted hazelnut praline. The food was fantastic with each course being perfectly cooked despite having to serve around 100 guests. The portion size was just right, leaving guests satisfied but not too sluggish to enjoy the celidh band that followed. The evening finished the cellar bar, which is part of the original wine cellars. The atmosphere was that of a trendy city bar and was the perfect place to enjoy one of their cocktails, or more champagne. I hear Middleton Lodge runs the Cellar Door Supper Club, in which their Head Chef Robert Taylor serves cuisine alongside fine wines and live music accompaniment; I will certainly be putting myself on the list for that!